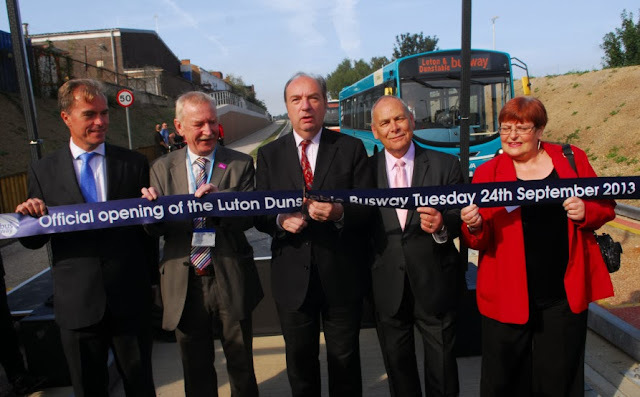 AFTER 20 years of planning, the controversial £91 million Luton Dunstable Busway has been officially opened by Transport Minister Norman Baker. At a special ceremony held this morning (Tuesday), the minister cut a ribbon on the 4.8-mile concrete guideway and unveiled a plaque at the new Luton Station bus-rail passenger interchange. Mr Baker also conducted a ceremony to mark the start of on-line works for the £24 million Luton Town Centre Transport Scheme that will see long-awaited completion of the inner ring road together with additional improvements for motorists, pedestrians and cyclists in the town centre. The government has supported both major local infrastructure projects, with £80.3 million awarded for the Luton Dunstable Busway in March 2010 and £15.8 million provided for the Town Centre Transport Scheme. Speaking at the launch, Mr Baker said: “There is no doubt that our town centres benefit from investment in the bus, which is the backbone of public transport and sustainable transport generally. “This is the way forward. Congratulations to those who have had the foresight to develop this scheme which will halve journey times with its frequent service. “This area is currently undergoing a major rejuvenation and it will now have a much improved public transport system to match. It is hoped that the controversial Busway, will enable fast, frequent and reliable services to link Dunstable, Houghton Regis and Toddington with Luton town centre and on to Luton Airport. Together with the priority buses receive at junctions, the separation of buses and normal traffic ensures that services can bypass congestion ‘hotspots’ and deliver the shortest journey times for the passengers. Before the ribbon cutting in Luton, councillor Dave Taylor said: “This is a very special day. The Luton Dunstable Busway is a monumetal project, and will provide fast frequent and reliable journeys. “I am delighted that Arriva, Grant Palmer and Centrebus have shown their commitment to this project and will be providing their services. Central Bedfordshire councillor Nigel Young added: “I can’t believe we are here after all of these years.